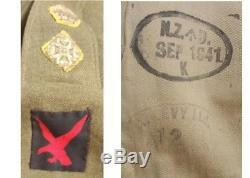 New Zealand Made Battle Tunic To the 4th Eastindian Division. WW2 two pocket, open collar. Single pip and crown denoting rank of Lieutenant-Colonel. Black division patch on each sleeve to the 4th Indian Division, the first formation to leave India. And formed part of the original desert force in Egypt. Maker stamp to the interior N. D with a large Broadarrow stamp, and the date Seprember 1941. 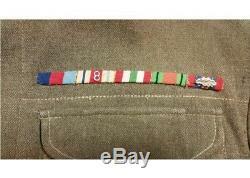 Ribbon bar in place over the left pocket, showing an 8th Army medal, and Mentioned In. Tunic shows minor mothing to the bottom of the pockets. If you have any questions or require more photos please let me know. All items are described honestly and to the best of our ability. Please ignore mailing cost listed. We only charge actual mailing cost as per quote from the post office. All items are mailed with tracking numbers and signature required. All items are guaranteed to be 100% original, and as listed. What is shown in the photographs is what you will receive. 5% GST applies to Canadian Residence. The item "New Zealand Made Battle Tunic To the 4th Division" is in sale since Tuesday, June 26, 2018. 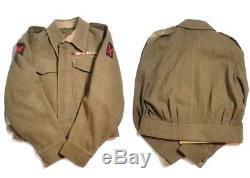 This item is in the category "Collectibles\Militaria\WW II (1939-45)\Original Period Items\Great Britain\Uniforms". The seller is "10thbattalion" and is located in Calgary, AB. This item can be shipped worldwide.